ALL information contained herein is derived from public sources, widely accepted scientific principles, and/or authors first hand experience. The author has NO written or verbal agreement with ANY governmental agency forbidding disclosure of the information contained herein. In disclosing this information, the author is exercising his right to free speech as a private citizen of the United States of America. While the author advocates the discovery and disclosure of the American covert weapons infrastructure, NO ATTEMPT should be made to interfere in any way whatsoever with the personnel and/or operations of said infrastructure. The proper method for achieving discontinuance of these activities is through court ordered injunctive relief. What does the Brookhaven national laboratory, Montauk Point state park, the decommissioned Shoreham nuclear power plant, and the mid-air explosion of TWA flight 800 have in common? The primary purpose of this paper is to delineate the connection between these seemingly unrelated locations and events. The paper also serves as a practical example of the American covert underground infrastructure, the methods employed by it's architects, and the goals of it's workforce. 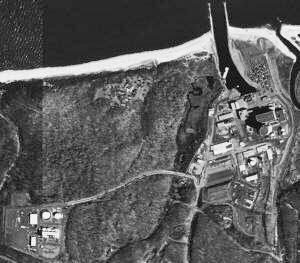 While the Montauk site is at this point, well documented by many different authors, most fail to fully appreciate it's interrelationship to the other locations covered in this paper. The central player is the Brookhaven national laboratory. As we shall see, the other locations and events exist in relationship to the capabilities and geographic location of this laboratory. I have included an aerial photo of eastern Long Island to show the geographic relationships. The photo below is a composite image, created from USGS (united states geological survey) aerial maps, showing the eastern end of Long Island, New York. This photo illustrates the geographic relationships between the various facility locations and events. 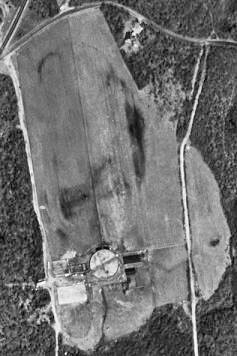 The photo on the right is an aerial view of the Brookhaven National Laboratory (BNL). One of ten national laboratories overseen and primarily funded by the Office of Science of the U.S. Department of Energy (DOE). The large circular area in the upper middle of the photo is the 2.4 mile radius RHIC (relativistic heavy ion collider). At the time of this photo (august 1994), the RHIC was still under construction. Below and slightly to the left, a second smaller ring called the AGS (alternating gradient synchrotron) is also visible. 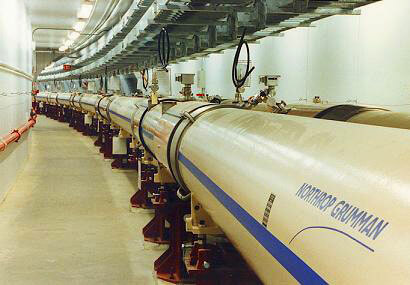 These devices are collectively known as particle accelerators. The RHIC uses super conducting magnets cooled by liquid helium, and requires 5 million watts of electrical energy just for refrigeration. While no figures are available for total RHIC power requirements, a value in the range of 20 to 40 times the refrigeration load is a safe assumption. This would equal 100 million to 200 million watts of electrical power. Now we see the true purpose of the Shoreham nuclear power facility. Although the actual particle accelerators are buried in underground tunnels, many of the support structures are above ground. Notice that most administrative, and research facilities are laid out in a grid pattern, but some structures are oriented odd angles. 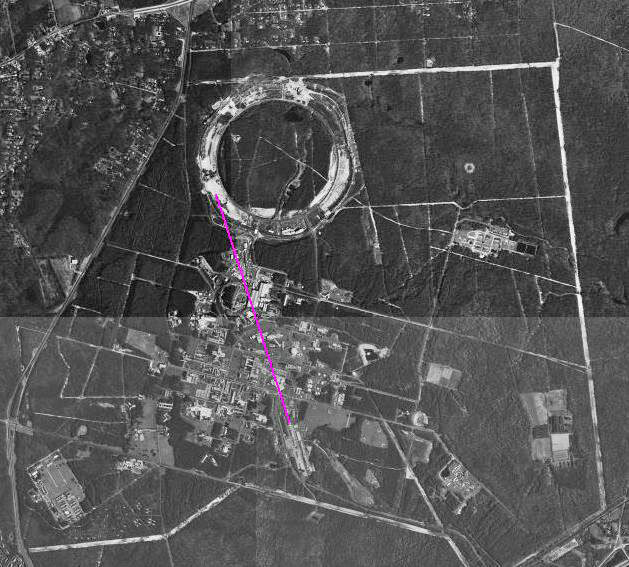 In particular, the purple line (image above) connecting the left hand edge of the RHIC ring and the right hand edge of the AGS ring, terminates at a group of structures in the lower middle of the photo. 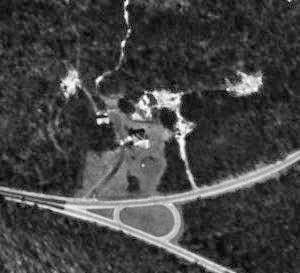 In the upper color photo, these structures are located in the lower right hand corner, and appear to be a row of metal sheds, with the first one set at a slightly different angle, as if they just happen to follow the road. In reality, their location and orientation is no mere accident of convenience. These building house the support equipment for a first generation particle beam weapon system. 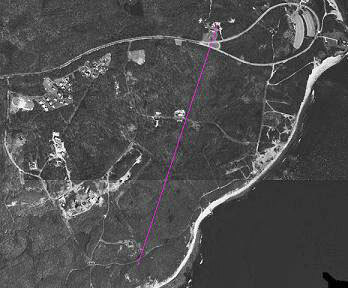 It is also no accident that a line drawn from bottom end of this row of structures intersects the crash site of TWA flight 800. The RHIC and AGS rings are used to accelerate packets of subatomic particles to velocities near the speed of light. These packets are then shaped, focused, and launched at the target by equipment located under the row of metal sheds. The color image above shows a close-up view of another installation located along this same particle beam alignment, known as the NSLS (national synchrotron light source) also visible in the previous photo. This facility uses an electron (ring) accelerator to produce high power ultraviolet laser light. The laser beam serves two purposes. At low power, it's used for target acquisition and tracking. However it's primary (high power) function is to create a partial vacuum "tunnel" through the atmosphere to the target. This allows the particle beam to travel without attenuation or scattering by air molecules. The facilities listed in this analysis are examples of the "dual use" doctrine. In other words, these facilities comprise an advanced particle beam weapon system, disguised as legitimate scientific research laboratories. The majority of scientists and technicians working at this site have no idea their efforts are being used to conceal such a sinister purpose. To hide this monstrous device behind a facade of innocent scientific pursuit, is typical of the people and organizations that have created the covert underground infrastructure in America. The following are direct quotes from a public relations document called "RHIC by the Numbers", published by the Brookhaven National Laboratory (BNL). RHIC's beam travels at 99.995 percent the speed of light (186,000 miles per second, or more than 300,000,000 meters per second). RHIC's beam is not continuous - it's made up of 57 separate "bunches," each containing billions of ions. RHIC ions are so small that, even at nearly the speed of light, the force of their impact is about the same as the impact of two mosquitos colliding. From the BNL website, we discover that gold (Au) atoms are used for the particle beam. E = Energy in Joules. M = Mass in kilograms. V = Velocity in meters per second. At 99.995% of light speed, the effective mass is slightly more than 100 times the rest mass, therefore our 2 billion gold atoms have an effective mass of 6.5394-13 kilograms. Next, the speed of light is 299,792,458 meters per second in a vacuum, and 99.995% of light speed is 299,777,468 meters per second. And since the RHIC stores 57 "bunches" or packets of particles, the total energy is: 57 * 29383.7 = 1,674,871 Joules. This is nearly 3 times the energy of a 3500 pound automobile crashing into a wall at 60 miles per hour! And all of this energy concentrated into 57 packages, each smaller than the period at the end of this sentence, AND traveling at nearly the speed of light. It should be mentioned that according to BNL, the RHIC did not produce a particle beam until July, 1999. However, given the covert nature of DOE, this date is suspect. Furthermore, as the line drawn on the aerial photo of BNL clearly shows, the AGS ring is also capable of supplying particle beams to the weapons system buildings. 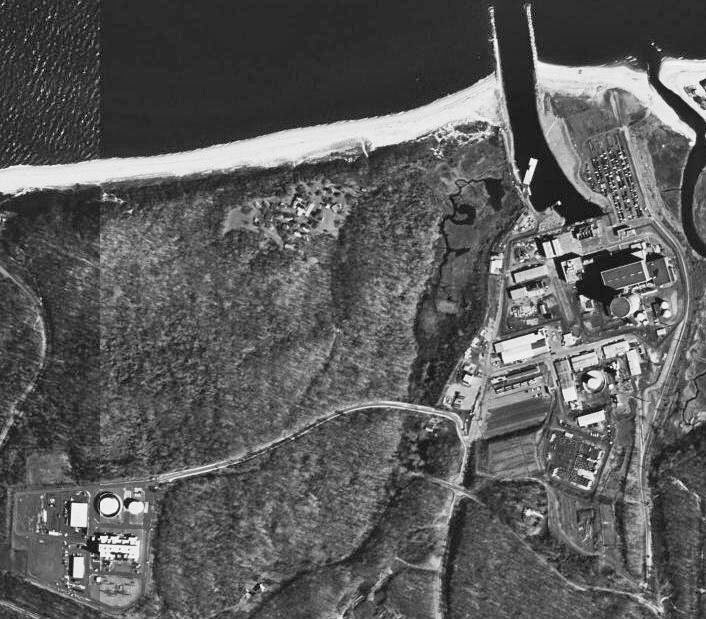 The photo on the right is an aerial view of the Shoreham nuclear power generation facility, owned by Long Island Power Authority (LIPA). According to LIPA, this facility was decommissioned in June,1987 and the nuclear fuel removed. This photo was taken in August 1994. Note the parking lot full of cars, in the upper right hand corner of photo. Also note the cars parked along left hand edges of buildings in lower left corner of photo. Another unusual feature is the secluded complex of buildings in the upper middle of the photo. Notice how a strip of forest was left between the complex and the beach for concealment. Also, notice the concealed low traffic road connecting this complex to the road in center of the photo. One other interesting feature is the trail leading from the beach, to the right hand edge of the complex. When taken all together, this complex has the classic signature of a rural underground access point. This facility is fully operational, and being used to supply electrical power to the covert particle beam weapon system at Brookhaven national laboratory. Note: at the time of it's decommissioning Gov. Mario Cuomo, coerced New York's public-utilities commission into the following agreement with LIPA: The power authority could pass the cost of Shoreham along to its customers only if it agreed not to operate the plant. Another example of how the cost of American underground infrastructure is covertly shifted to an unsuspecting citizenry. The photo on the right is an aerial view of Montauk Point state park, and Camp Hero military reservation, both located at the eastern tip of Long Island. The loop highway and large parking lot in the upper right hand corner are adjacent to the Montauk light house (a national monument). The complex of roads and structures stretching from the left hand edge of the photo, and continuing to the right hand edge comprise the Camp Hero military reservation. For many years there has been a continuing controversy surrounding the Camp Hero military reservation (CHMR). According to many accounts, this site has been secretly used for experiments in mind control, advanced weapons research/testing, and as a time machine portal. These clandestine endeavors are commonly and collectively known by the term "Montauk Project". At first glance, mind control, particle beam weapons, and time travel may seem to have very little in common. However, all three tasks make use of high power electro-magnetic energy. The particle beam accelerators at Brookhaven are used to supply the needed energy (directly in the case of particle beam weapons, and indirectly in the case of mind control, and time travel). The photo above is an enlargement of the bottom center section of the previous photo. Notice the ring shaped artifact measuring approximately 100 yards in diameter. A cross check of the USGS topological survey map indicates the artifact does NOT correspond to any natural land feature. This artifact is the visible surface signature of an underground structure. Manifestations of this kind are caused by two distinctly different processes. (1) Disturbance of the natural aquifer by the underground structure. (2) EM or heat leakage from the underground structure modifying surface vegetation growth. 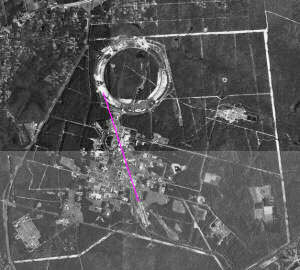 A 100 yard ring is too small to be a primary particle beam accelerator, however it is just the right size for an electron synchrotron of the type used to create a partial vacuum "tunnel" through the atmosphere to the target (see NSLS, Brookhaven analysis far above). Another use for electron synchrotron generated radiation is human behavior modulation (mind control). While the radiation it self is pure EM, the electron synchrotron generation process allows access to parts of the EM spectrum that are not normally available through the use of conventional RF generators. These wavelengths are particularly useful since they are of the same scale (size) as certain microstructures within the human brain. Furthermore, since the wavelengths in question do not occur in the natural environment, the human brain has no innate immunity. The high power levels that can be achieved with an electron synchrotron allow many subjects to be "treated" simultaneously. The above photo is another enlargement from a section of the first photo. Again we see a ring shaped artifact (albeit better hidden). The artifact is more indicative of aquifer disruption than direct vegetation disturbance. 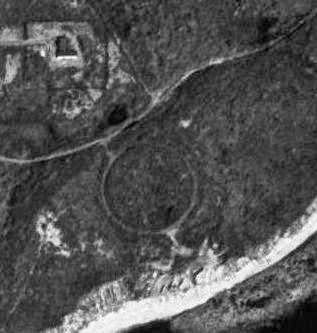 This ring is located above, and slightly to the left of the smaller ring shown in the previous photo. Also, once you know where to look, the ring is actually more noticeable in the large photo above this one. With an approximate diameter of 275 yards, the ring is about the same size as the AGS particle accelerator at Brookhaven. 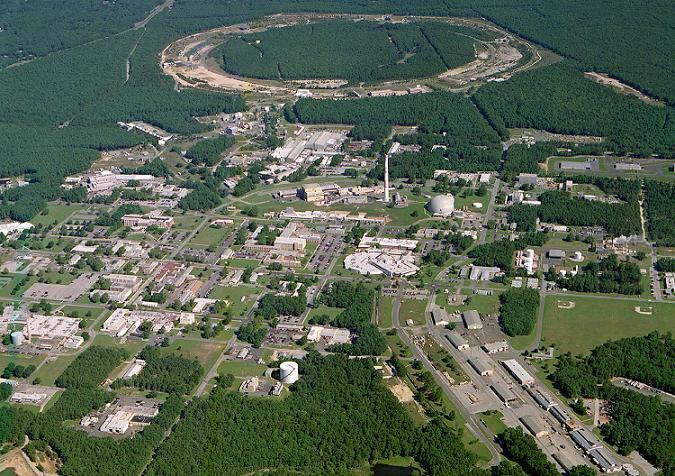 The ring could be a primary particle beam accelerator, but with the Brookhaven facility so close, a better use would be as a secondary storage ring for the primary particle beam accelerator rings at Brookhaven. This conclusion is supported by the fact that accelerators require considerably more power than storage rings, and a plethora of ancillary equipment that would represent needless duplication of the Brookhaven facilities. Locating the particle beam weapon launch facility is more problematical. At Brookhaven the dual use nature of the facilities makes the task relatively easy, however the Montauk underground complex is by definition a covert (secret) base and therefore far less clues are available for analysis. Assuming the particle beam weapon launch facility isn't completely camouflaged, and assuming the two rings connect to the launch facility via straight beam line, the best choice for the particle beam launch line shown in the photo above. The second photo on the right shows an enlarged view of the suspect particle beam launch point. It is interesting to note that ALL of these particle beam weapon components are outside the fenced off portion of CHMR. A classic example of misdirection, and the "hide it in plain sight" doctrine. An analysis of the time portal systems is beyond the scope of this document. Suffice it to say that experiments involving time displacement are unbelievably dangerous and therefore an isolated site, located well away from major population centers and valuable infrastructure (such as Brookhaven national laboratory) is advisable. An operation of this magnitude requires considerable above ground support facilities. In particular, particle beam components are large and cumbersome, therefore they must be trucked into the site. A line of trucks, waiting to unload their cargo would be a dead give-away, furthermore truck drivers are notorious gossip mongers. Therefore a nearby cargo container staging yard is needed. Located on old Montauk highway, at the junction with the new Montauk highway, the area shown in the photo above would make an ideal cargo container staging yard. 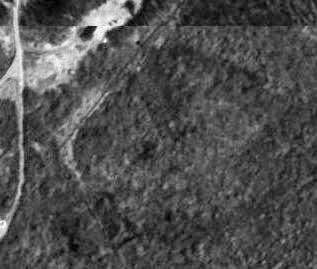 The large circular structure near the bottom of the photo does not cast much shadow, and is most likely an "in ground" tank. The Montauk (and CHMR) site show most of the classic indicators of an underground access point. Furthermore, the identified artifacts (above) are commensurate with the alleged facility uses, both in terms of size and shape, and in terms of geographic relationship to each other. Therefore, it is the authors opinion the Montauk point state park, and CHMR are in fact a covert underground facility, operating under the aegis of the United States government. On July 17, 1996 at 8:31PM (EDT) TWA flight 800, a Boeing 747-100 (registration N93119) experienced an in-flight explosion just 12 minutes, 51 seconds after being cleared for take off from JFK international airport. The explosion took place over the Atlantic Ocean (Location: 72:37.46N, 40:39.52W), approximately 9 miles south of East Moriches on Long Island, New York. Of the 18 crew members and 212 passengers on board, none survived. The ensuing NTSB (national transportation safety board) investigation was the most thorough and comprehensive in American aviation history. Yet no definitive cause for the explosion was ever discovered. In it's final report, the NTSB lists the probable cause as an explosion in the center wing fuel tank. I believe that TWA flight 800 was the victim of a particle beam weapon attack, launched from the Brookhaven national laboratory in order to test system effectiveness against air born targets. This would not be the first time an agency of the American government has used unsuspecting citizens as experimental test subjects. One need look no farther than the Tuskegee syphilis study, or the 1950s nuclear bomb tests on army personnel to discover how little regard the American government has for the lives of it's citizens. 1. Flaws in the NTSB probable cause, and certain investigative steps that were performed in a superficial manner. 2. The presence of certain physical and logistical indicators that were completely ignored by the NTSB. I shall cover each separately, starting with category number one. Commercial jet fuel (known as JP4) is a refined variant of kerosene, very similar to common diesel fuel used in trucks and buses. Unlike gasoline, JP4 has a low vapor pressure. In other words, it does not evaporate quickly. As anybody who has ever worked around diesel fuel will attest, an open container of diesel does not evaporate, even over time spans measured in days. While kerosene stoves are no longer common, anybody who has used one will tell you that dropping a lit match into the fire box does not work. The match is extinguished. You must use a piece of paper to act as a wick in order to ignite a kerosene fire. The NTSB claim of an explosion in the center wing fuel tank as the probable cause, while consistent with much of the physical evidence, leaves the question of ignition source completely unanswered. This is the fatal flaw in the NTSB probable cause. The following are excerpts from the NTSB Medical/Forensic Group Chairman's Factual Report of the investigation (exhibit 19A). The first 99 bodies were found floating on the surface of the ocean and were recovered by various civilian, military, and police vessels during the night of July 17, 1996, and throughout the day of July 18, 1996. The majority of the remaining victims were recovered by U. S. Navy divers and local police divers during the next 96 days. Pertinent data on the location victims were found, when available, and the circumstances of the recoveries of the victims were also recorded. The remains were then placed in a refrigerated trailer and transported to the Suffolk County Medical Examiner's Office (ME) in Hauppage, NY. All victims were then autopsied by a forensic pathologist from either the ME or a pathologist temporarily assigned to the ME by the State of New York or a neighboring jurisdiction. The ME had 5 autopsy tables available and during the early recovery efforts, all tables were utilized. The thoroughness of the forensic post-mortem examinations was highly variable depending primarily upon the pathologist who performed the autopsy and upon case flow. The primary objective of the ME was to identify all remains, and the ME was under constant and considerable pressure to do so with minimal delay. Consequently, a high priority was not placed on performing a detailed forensic autopsy directed toward elucidating mechanisms of injury. An effort was not made to relate damage to clothing with wounds on the body. Foreign material removed from the bodies was immediately released to an FBI technician, but autopsy reports did not record whether the material was found loosely within the body bag, in open wounds, or whether the foreign body had penetrated the skin and was found lodged in tissue. Trajectory information was not recorded. No record of the condition of the tympanic membranes of the victims was made. As the above excerpts show, of the 230 passengers and crew, 99 bodies were recovered in the first 36 hours. The bodies were stored in a refrigerated truck. The ME had 5 autopsy tables available, AND all 5 were used. Assume 4 hours per body to perform a comprehensive autopsy, with two shifts working 8 hours each. With 5 autopsy tables, 20 autopsies per day can be performed, and therefore 99 bodies can be autopsied in just 5 days. Yet the final excerpt paragraph states the ME was under "considerable pressure" to perform with minimal delay, AND the rest of this paragraph enumerates all of the procedures that were NOT performed during the autopsies. Perhaps most telling, is the last sentence which states that no record of tympanic membrane (ear drum) condition was made. Such a record would have been conclusive evidence of cabin over pressure (internal explosion), or abrupt cabin depressurization (external explosion). To perform autopsies in such a superficial manner, in a situation where the evidence uncovered by those autopsies may help in determining the precise cause of an aircraft explosion, boarders on criminal negligence! Unless of course the true cause is already known, and thorough autopsy reports would raise questions that could prove even more embarrassing than apparent negligence. 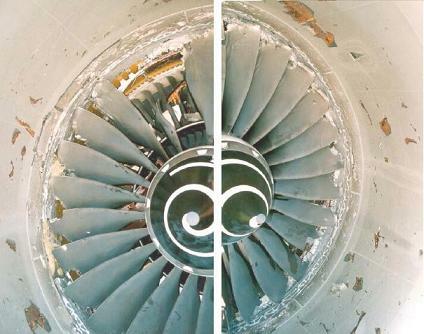 The photo on the right shows TWA 800 Engine No. 2 fan hub and blades. The blades are made from an alloy of 90% Titanium, 5.6% Aluminum, 4.2% Vanadium, and 0.2% Iron. Because this alloy is both very strong, and extremely brittle, the blades are cast in their final shape to minimize the amount of machining required. Under normal conditions, they will break rather than bend. Yet as the photo clearly shows, many of the blades are bent, some by as much as 90 degrees. How do I support this conclusion? Compare this photo to the next photo. 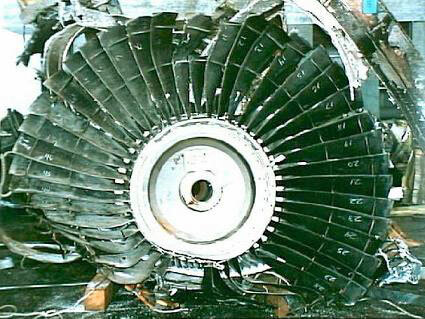 The photo shows two views of a typical fan blade failure. In this case, one of the blades suffered progressive fatigue cracking at the root where it connects to the fan hub. The failure occurred on January 31, 2001 on a Boeing 777-300 at Melbourne International Airport, during the take-off run, and the flight was safely aborted. Notice how many of the remaining blades are missing portions of their tips, and one blade (adjacent to the missing blade) broke off at it's mid-section. However, none of the blades show ANY sign of bending, even though this engine (unlike TWA 800) was operating at full take-off power when the failure occurred. Clearly, something very odd AND very extreme took place in the final moments of TWA flight 800. Furthermore, the TWA 800 photo is intentionally posed in such a manner as to imply the blades were bent by the weight of the hub/blade assembly, thereby removing any remaining doubt of complicity on the part of the NTSB. The NTSB while creating the illusion of great diligence, was in fact, a willing participant in a cover-up of monumental proportions. TWA eight hundred what's your rate of climb? TWA's eight hundred heavy ah about two thousand feet a minute here until accelerating out of ten thousand. roger sir climb and maintain flight level one niner zero and expedite through fifteen. TWA's eight hundred heavy climb and maintain one niner zero and expedite through one five thousand. TWA eight hundred amend the altitude maintain ah one three thousand thirteen thousand only for now. TWA's eight hundred heavy okay stop climb at one three thousand. TWA eight hundred you have traffic at one o'clock and ah seven miles south bound a thousand foot above you he's ah Beech nineteen hundred. TWA's ah eight hundred heavy ah no contact. TWA eight hundred climb and maintain one five thousand. TWA's eight hundred heavy climb and maintain one five thousand leaving one three thousand. ((sounds similar to recording tape damage noise)). At 2025:41 Boston center instructs TWA 800 to climb to 19 thousand feet, and to expedite the climb through 15 thousand feet. TWA 800 acknowledges 6 seconds later. Approximately 37 seconds after acknowledgement, at 2026:24 Boston center amends it's instructions to TWA 800. Instead instructing TWA 800 to climb and maintain 13 thousand feet. TWA 800 acknowledges 6 seconds later. Finally, at 2030:15, less than one minute before the explosion, Boston center instructs TWA 800 to climb to 15 thousand feet. TWA 800 acknowledges 4 seconds later. Why did Boston center amend it's climb instruction to TWA 800? Was there other conflicting traffic in the vicinity? The nearest traffic was a Beach 1900, 7 miles away, at TWA 800's 1 o'clock position, heading south. Since TWA 800 was heading east, this puts the Beach 1900 safely past TWA 800's flight path. By keeping TWA 800 at 13 thousand feet, and issuing the climb instruction just 50 seconds before the particle beam strike, the aircraft would still be climbing, thereby presenting a greater surface area for target acquisition. Was Boston air traffic control center involved in this hideous test of a covert weapons system? The evidence seems substantial. The plot on the right shows radar data (the blue dots), obtained by the NTSB from the Islip radar station on Long Island NY. Each dot shows the position of a an aircraft as the radar beam swept over the aircraft (the solitary, and closely spaced dots are slow moving water craft). For instance, dot 3 in each series is the position of that aircraft on the third sweep of the radar beam. 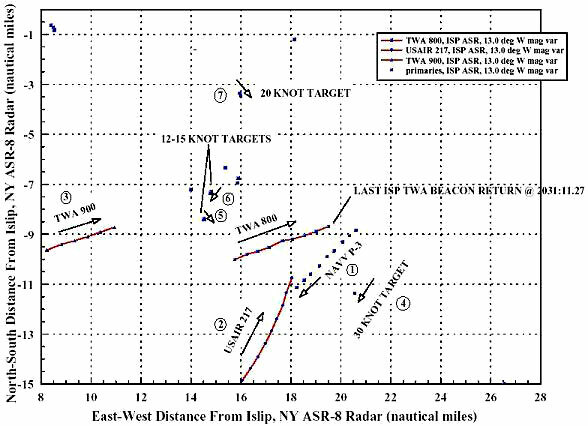 The plot shows the last 9 radar sweeps, before the destruction of TWA 800. Notice the aircraft labeled "Navy P-3" moving southwest. This is an anti-submarine patrol craft, equipped with highly advanced electronic surveillance systems. The aircraft would make an ideal observation platform to record the results of a covert particle beam weapon test. The P-3 is also a very robust aircraft (a variant is used for hurricane hunting), likely to survive even if it gets a bit too close to the target aircraft (TWA 800). An aircraft struck by a particle beam weapon will suffer two distinctly different types or classes of damage. Each class of damage will have a unique signature, neither of which is likely to be recognized by personnel trained in common explosives and/or structural failure mechanisms. The electro-magnetic damage will be the most unusual aspect of a particle beam weapon strike. The EMP (electro-magnetic pulse) will be dissipated in the immediate vicinity of the strike point, causing radical rearrangements in the chemical structure of the material. The material will momentarily soften, as if subjected to intense heat, but without the normal indications of thermal stress. Strikes on a living organism would result in intense localized cellular disruption, similar to microwave cooking, but again without the normal indicators of elevated temperature. This effect would be very noticeable during a thorough forensic autopsy, yet completely inconsistent with usual surface style heating produced by a conventional explosion. If a fuel tank were to suffer a direct strike, ignition would be instantaneous, regardless of vapor pressure and/or combustibility of the fuel. The kinetic damage will superficially resemble traditional structural failure. The primary cause will be violent shockwaves emanating from the strike point(s), and traveling through structural members. The result will be fracturing at locations where the shockwaves concentrate, either through geometric focusing, or through standing waves created by reflections.